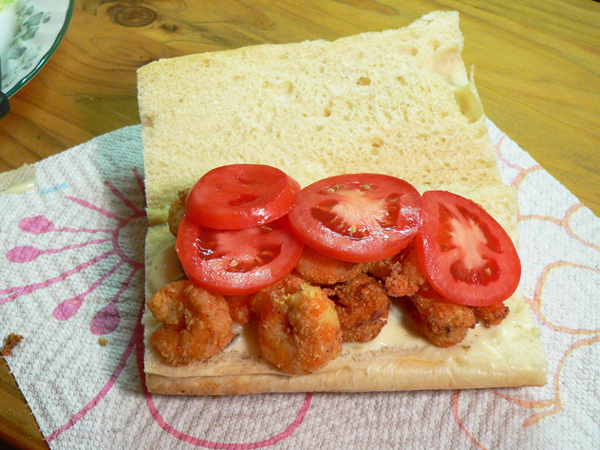 Follow step-by-step, photo illustrated instructions for making this Shrimp Po’ Boy Sandwich. We’ll show you how to make your own seafood breader, how to deep fry the shrimp, and how to assemble this quick and easy sandwich. Bring the taste of the coast right to your table. Printable recipe included. 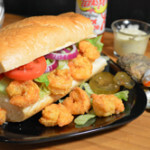 Whether you call it a “Poor Boy,” or a “Po’ Boy,” this sandwich just hits the spot when you’re in the mood for a little bit of seafood, but not ready for a big full plate of fried goodness. Yes, we like our seafood here in North Carolina, and we usually get a generous portion on the plate when eating out at a good seafood restaurant. But, sometimes you’re just not ready for one of those big platters of “lightly fried and lightly battered” oysters, shrimp, fish, deviled crab, scallops, and clam strips. Yep, you can get all of it on one big platter from most any true seafood restaurant across the state. They’ll even add french fries or baked potato, Cole slaw and a basket of hush puppies, just in case you’re hungry. How in the world do we eat it all? Years back, we offered a “Captain’s Platter” at my brothers seafood restaurant, and it included ALL of the above mentioned items. It was one of our most popular dishes and it contained a LOT of fried seafood. Sadly, you could get all of that back then, for what I paid for one pound of shrimp just a few days ago. My, how times do change. Most folks in North Carolina seem to get a craving for seafood on Friday night. It’s become tradition to gather with family and friends, and make a trek to a local favorite seafood restaurant each week on that night. Of course, the decor has to include fish netting, big ropes, pegged leg fishermen sculpted from wood, ships steering wheels, and more often than not, some plastic seagulls or fish on the walls. You know you’re in a good place, when the waitress brings a pitcher of iced tea to the table for the group. She can probably call you by first name as well, because you eat there each and every Friday night. 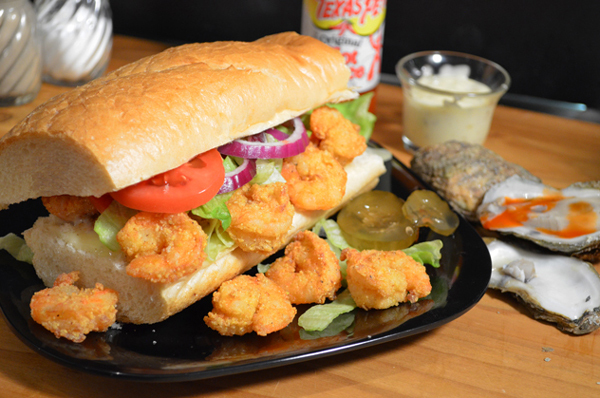 But again, when you’re not up to all that food, perhaps our Shrimp Po’ Boy will tame that hunger for a taste of the sea. I’m not sure why it even comes packed between two huge pieces of bread. It’s practically impossible to pick up and eat it the way it’s prepared. Even if you could get it in your mouth, it’s probably going to fall apart when you lift it to try. You’ll also need a fork. It’s likely you might balk at my use of Lard to fry the shrimp in. To me though, it’s the ONLY way to fry seafood. We use to get 50 pound boxes of lard in the restaurant. They were messy, but it’s what gave our food such great flavor. I can still recall the cardboard boxes and those blue colored plastic bags inside, filled with snow white lard. There was always a greasy spot somewhere on the box from how it was packaged. Lard also forces you to get your food out to the tables really fast. It had to be served piping hot. If the fried food started to cool, the seafood would start to taste greasy. You most certainly didn’t want that. I’ve said it before, working at that seafood restaurant was some of the hardest work I’ve ever done. It was always hot in the kitchen, the days were long, and trying to feed 500 plus customers in just a few hours, could bring up some strong tension in the kitchen. 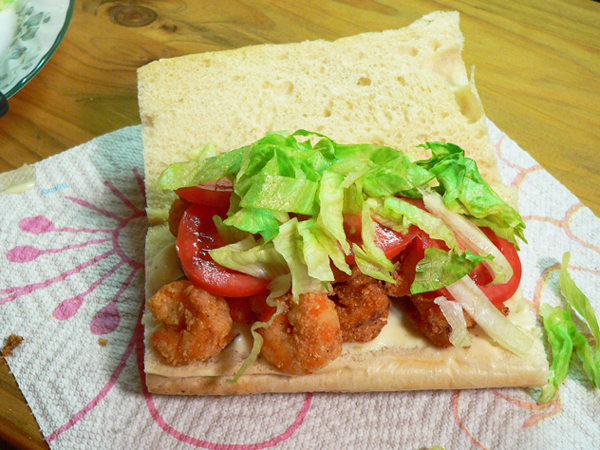 While I can’t giveaway any secret family recipes here, I do hope you’ll try our Shrimp Po’ Boy sandwich recipe. It’s pretty quick and easy, and something all the family should enjoy. I’m making a simple seafood breader, but you can most certainly use any of the ready made breaders on the market to make the recipe even easier. North Carolina is blessed with several companies that provide seafood breaders, hushpuppy mixes and more. I hope you’ll try a few of them along the way. Ready to taste some of the bounty of the sea? Alright then… Let’s Get Cooking! Shrimp Po’ Boy Sandwich: You’ll need these ingredients. 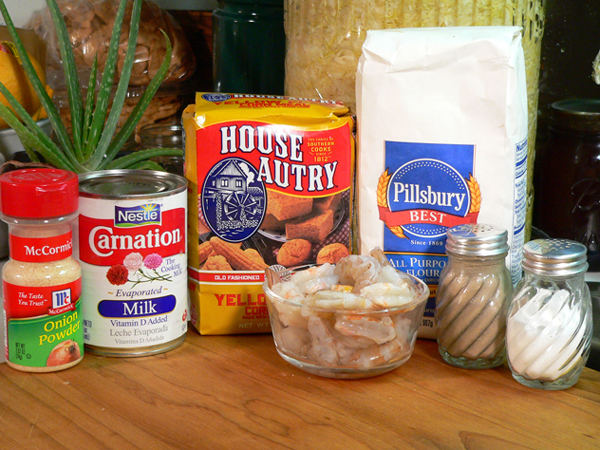 The above ingredients will be used to make the seafood breader, and to fry the shrimp. You’ll need some type of oil for frying, and of course a loaf of French Bread. Toppings to “dress” the sandwich typically include, tomatoes, lettuce, and pickles or onions. Tartar sauce is often used as well. 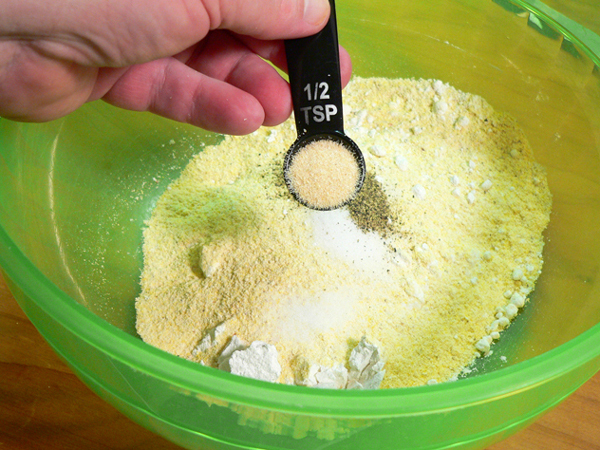 To Make The Seafood Breader: Start with a good size mixing bowl. 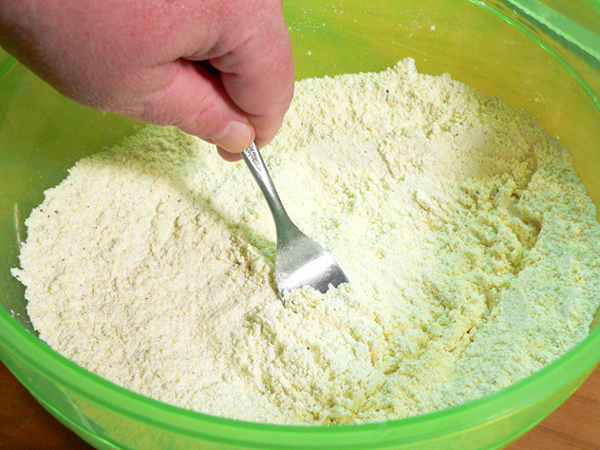 Add the flour. Add the Corn Meal. 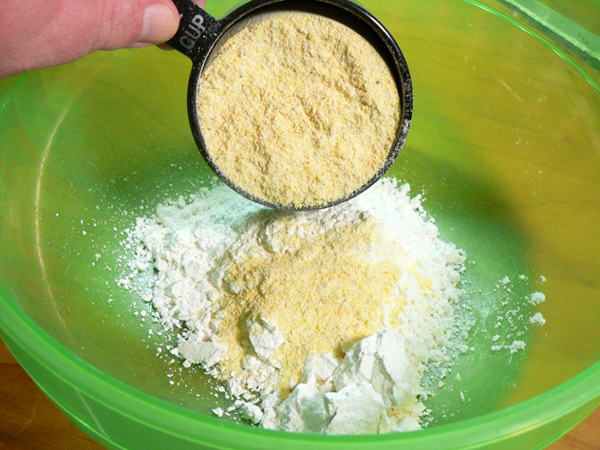 We’re using House-Autry brand Yellow Corn Meal. House-Autry also makes a complete Seafood Breader that you could use if desired, but we’re making this one from scratch. 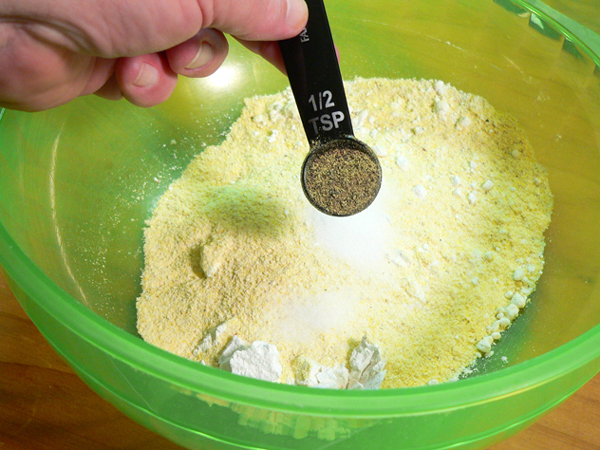 You can easily adjust the seasonings in this breader to your own personal preference. Go ahead, make it your own. 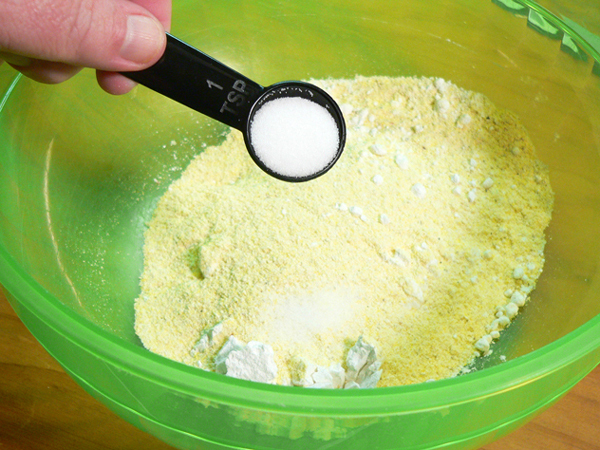 Use a fork, and stir the dry ingredients together really well. Jumbo shrimp may need to be peeled, de-veined and rinsed. 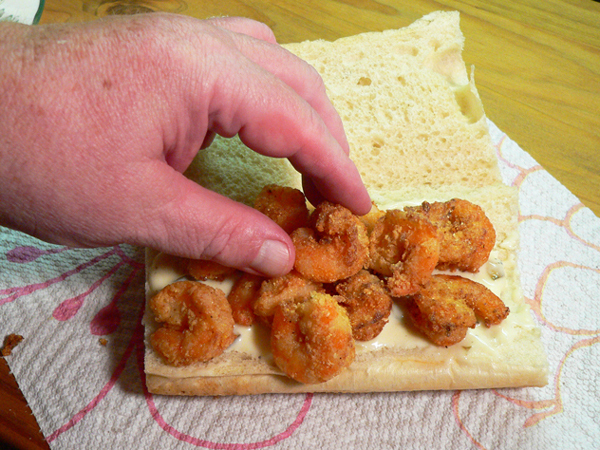 Smaller popcorn shrimp are most often used to make this sandwich. Just make sure you rinse either well under cold running water. Drain them for a minute or two, then place them in a bowl. Add the Evaporated Milk. You just need enough milk to be able to fully coat all of the shrimp you’re intending to use. Toss the shrimp around in the milk, making sure you get each one fully coated with milk. Set aside until ready to fry. It’s best if the shrimp are at about room temperature before you apply the breader and fry them. If you don’t have an electric deep fat fryer, a medium size sauce pot will work. You just need to be extra cautious when doing so to prevent any fires or damage. Here, I’m adding Lard to the sauce pot. We always used Lard when frying shrimp in the Seafood Restaurant. You’ll need enough to have about 3 to 4 inches of oil in the pot once it melts down. 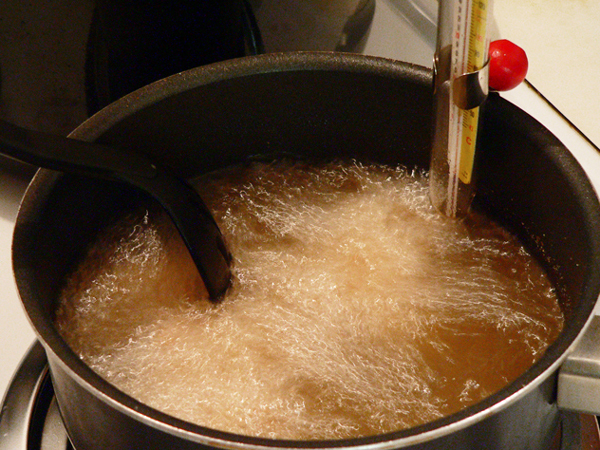 Place the pot over Medium heat and use a thermometer to let the heat rise to 375ºF for frying. 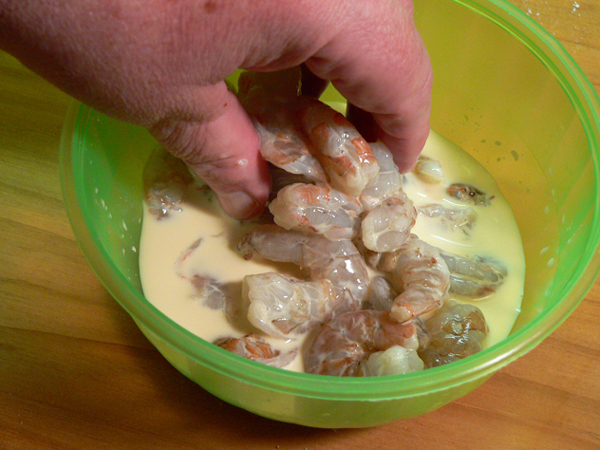 When the lard is melted and up to temperature, stir the shrimp in the milk once again. 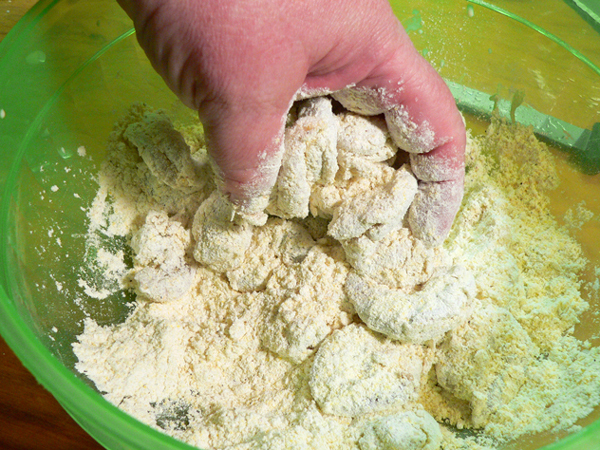 Then, lightly shake off any excess milk and drop the shrimp into the breader. 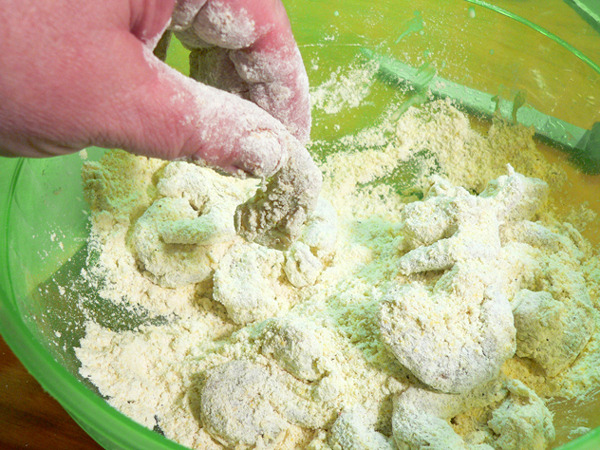 Toss the shrimp around in the breader, making sure each one is fully coated with the breading mix. Shake off any excess breader from each shrimp. Place the coated shrimp on a single layer in a plate until the oil is hot enough for frying. 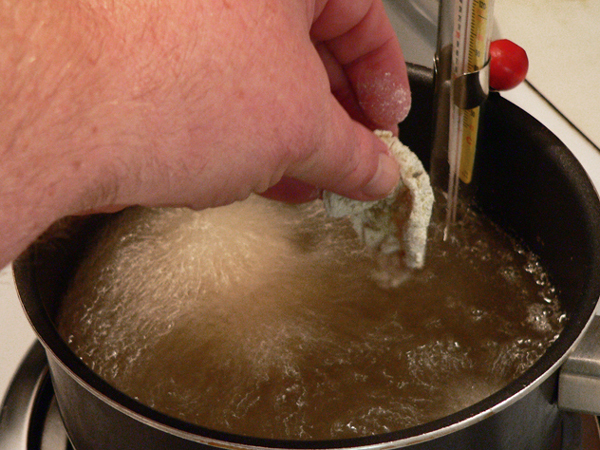 When the lard has melted and reached a temperature of 375ºF, carefully drop the shrimp into the oil. Be careful, it might splatter. 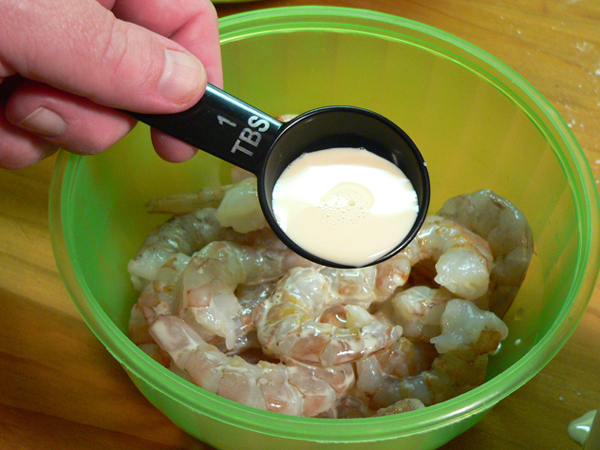 Using a slotted spoon, stir the shrimp around a bit to keep them separated. The shrimp will only need to cook for about 1 to 2 minutes, or until they are a light golden brown in color. The shrimp will float to the top of the oil when they are done, which doesn’t take very long depending on the size of shrimp being used. Most of the time is spent letting them get that golden color. Just don’t let them overcook, or they will be tough and chewy. When lightly brown, use the slotted spoon to remove the cooked shrimp from the hot oil. Place them on a wire rack if you have one that doesn’t let them fall through, or place them on a brown paper grocery bag to let them drain. Placing them on paper towels will take away some of the crispiness of the cooked shrimp. Assemble the sandwich: Now, let’s put it all together. 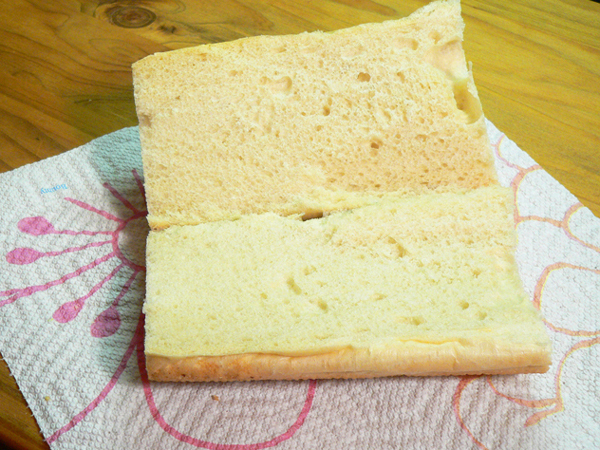 Cut your bread to the desired length, then split it open. You can leave it hinged on one side if you like, but chances are the sandwich will be so full it will break open anyway. 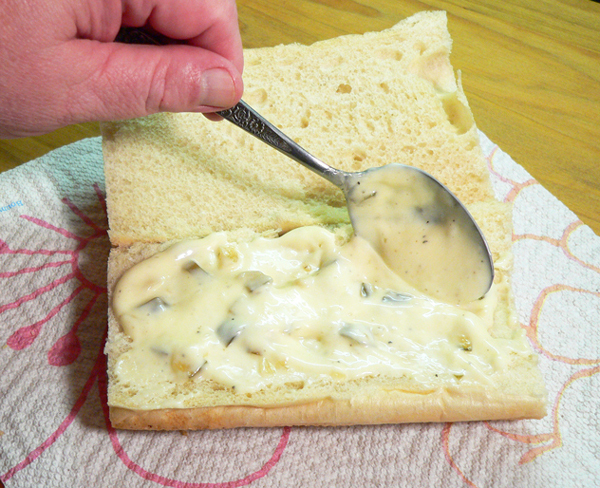 Spread on a thick layer of Tartar Sauce. You can make your own with this recipe from Duke’s Mayonnaise. Just click HERE and do a search on their website for Tartar Sauce. Good stuff. Place a generous layer of fried shrimp on top of the Tartar Sauce. It isn’t a good Po’ Boy unless it’s running over with shrimp. Add some Tomato slices. I personally like the little Roma Tomatoes. They’re perfect for small slices on our Shrimp Po’ Boy. Red Onion slices are then placed on top. They’re optional of course, just use what makes you happy. Serve this Shrimp Po’ Boy while still warm, and Enjoy! 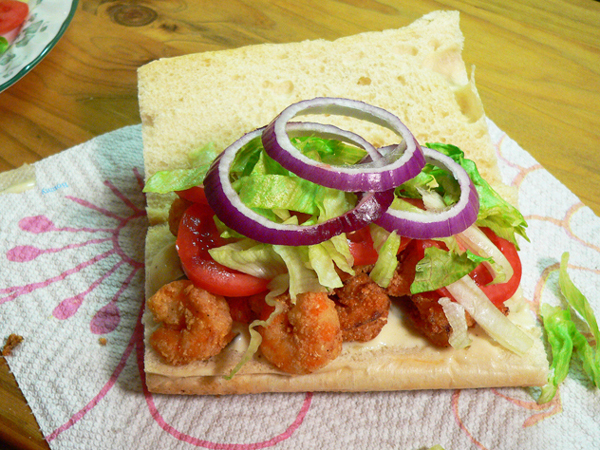 Follow step-by-step, photo illustrated instructions for making this Shrimp Po’ Boy Sandwich. We’ll show you how to make your own seafood breader, how to deep fry the shrimp, and how to assemble this quick and easy sandwich. Bring the taste of the coast right to your table. French Bread, or hoagie type rolls. Peel, de-vein, and rinse shrimp if needed. Drain well. Place shrimp in a small bowl. Add Evaporated Milk, stir well, set aside. 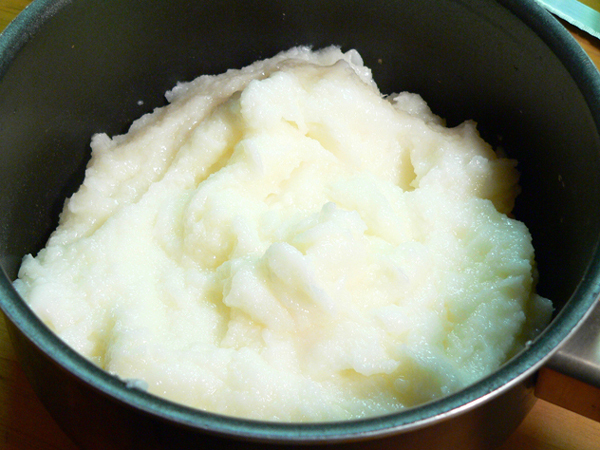 Place lard in a medium sauce pot over medium heat on your stove top. Heat the lard to 375°F for frying. 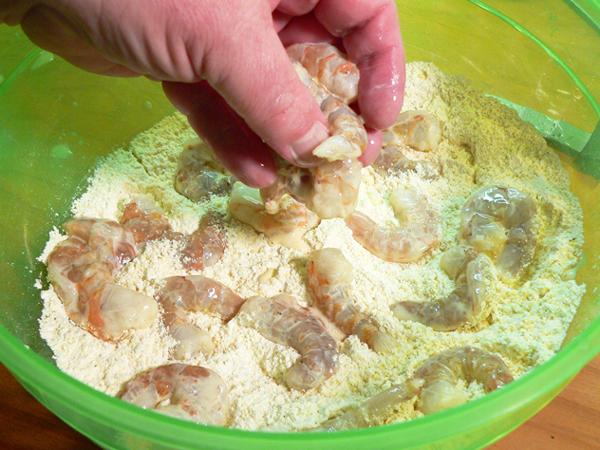 Place shrimp in breader mixture. 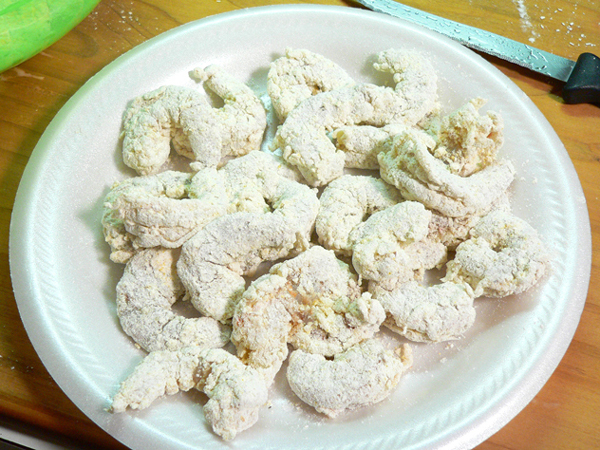 Toss the shrimp in breader until lightly coated. 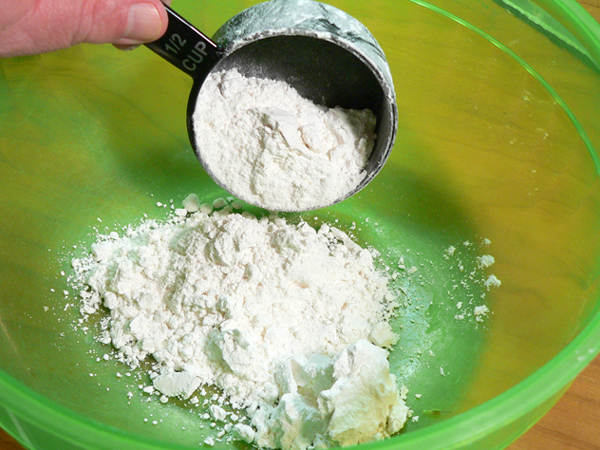 Shake off excess flour. Place shrimp in oil. Let shrimp cook for 1-2 minutes, or until lightly browned, stirring as needed. 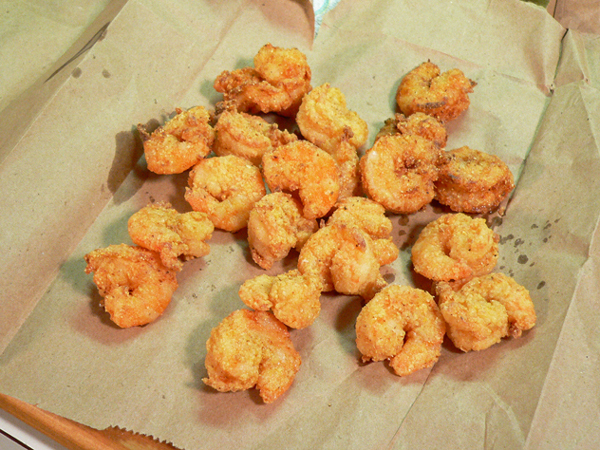 Remove shrimp from hot oil, place on brown paper bag and let drain. Add tartar sauce, lettuce, tomato slices, and onions as desired. Your Comments: Have you ever tried a Shrimp Po’ Boy Sandwich? Do you make them at home? I’d love to hear your comments on our recipe. It will only take a minute or two to share your comments with us in the Comment section below. I’d love to hear from you. And, if you try our recipe, your comments on how it turned out for you, just might cause someone else to try our recipes. Just know that all comments are moderated. That just means that I personally read each and every one of them before they are approved for our family friendly home here on the Internet. I also try to reply to as many comments as possible, so be sure to check back for that. Your comment will not appear immediately, but I’ll get it posted just as soon as I possibly can. Thank you in advance. Sign Up For Our FREE Newsletter: While you’re here, be sure to sign up for our FREE Newsletter. I try to send one out each week, after I’ve posted a new recipe here on Taste of Southern, or anytime anything of importance is taking place. It’s a great reminder to stop back for another visit, see the new recipe, and to keep you informed of our latest happenings. Just add your Email address to the Sign Up box below, or the one you’ll find in the top right corner of each page of our website. It’s super easy, and should you ever decide you’re just no longer interested, it’s even easier to unsubscribe. I’ll look forward to seeing you on our list. If you like our site, be sure to share our information with your family and friends. Is there another sauce that can be used on this sandwich, I do not like tartar sauce. Ranch maybe? Thanks. This was fantastic! I ate until I was as full as a tick. My grandmothers both had lard in cans in their kitchens for making the BEST biscuits (3 times a day every day) pie crusts, and frying. They both lived long healthy lives well into their 90s. As long as the lard is hot enough, the food absorbs very little of it and the flavor it adds will take you right back home. Thank you for your wholesome honest recipes! I’ve made this for my family twice so far and they love it.Never knew the sandwich was this simple to make. I love your site. I do so appreciate your friendly, uplifting and encouraging letter every Monday. Along with some interesting recipes to try! You are appreciated.